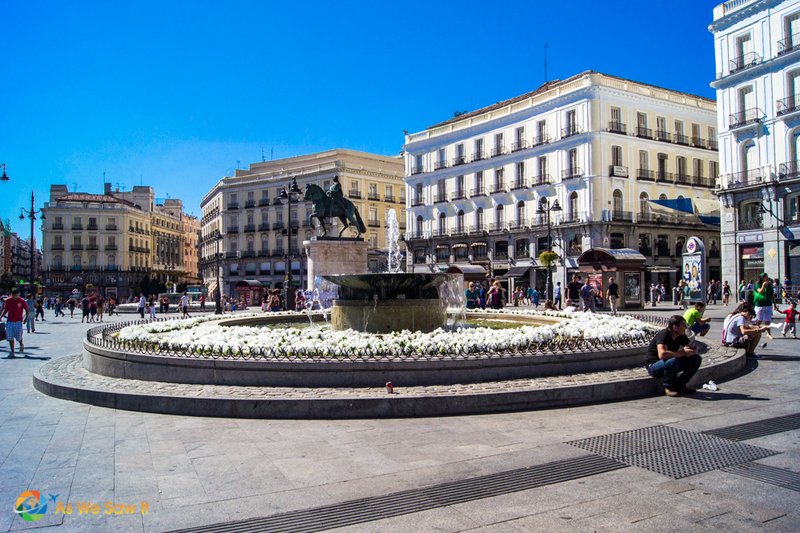 Here we are discovering so many beautiful fountains and squares in Madrid, the capital of Spain. 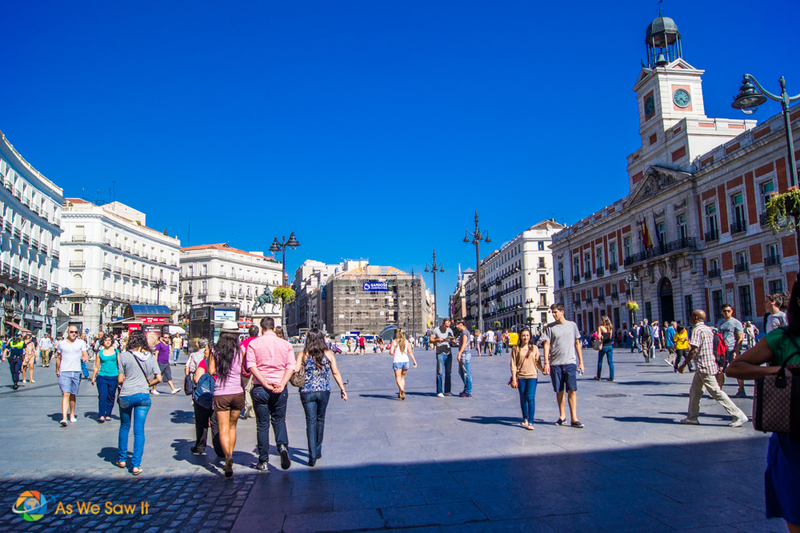 Like most European cities, Madrid has built its cities around central squares where people can gather to sell their wares, worship, conduct government business and greet each other. We took the easy way to get around the city. 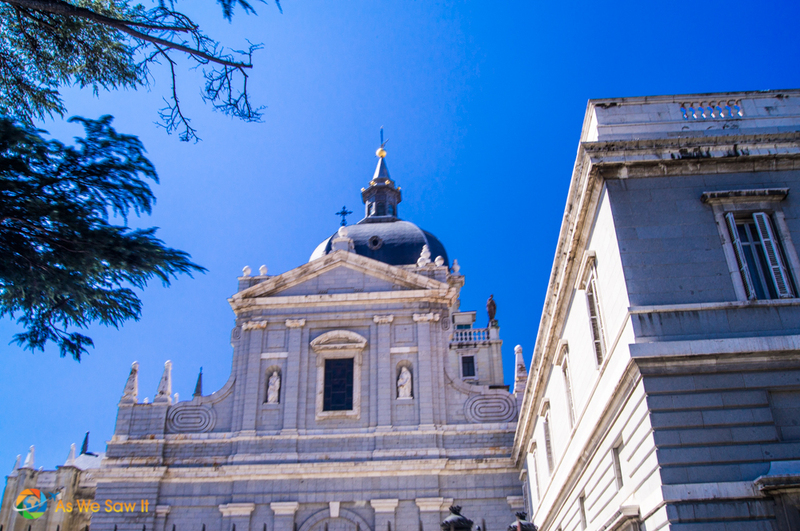 The best way to figure out the layout of Madrid is by taking a Hop-on Hop-off bus tour. 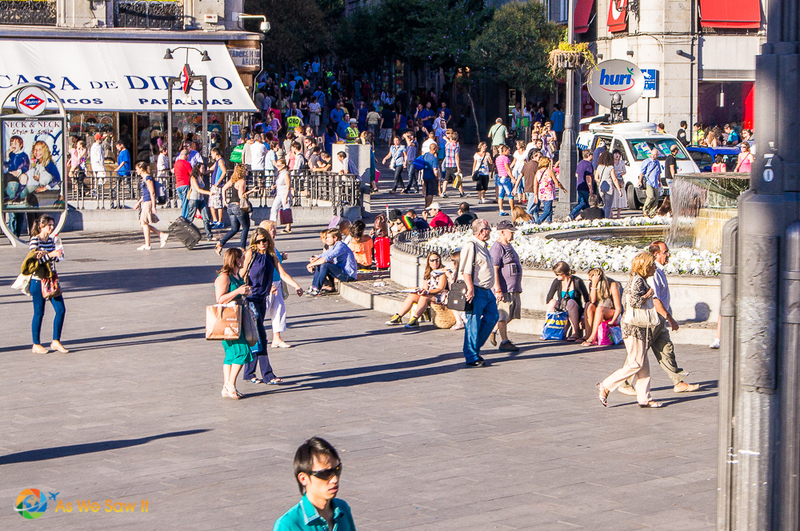 Puerta del Sol is the most crowded of the squares in Madrid, at least to us. It is also the most central: The kilómetro cero plaque on the pavement marks the symbolic “0 Km” center of Spain. 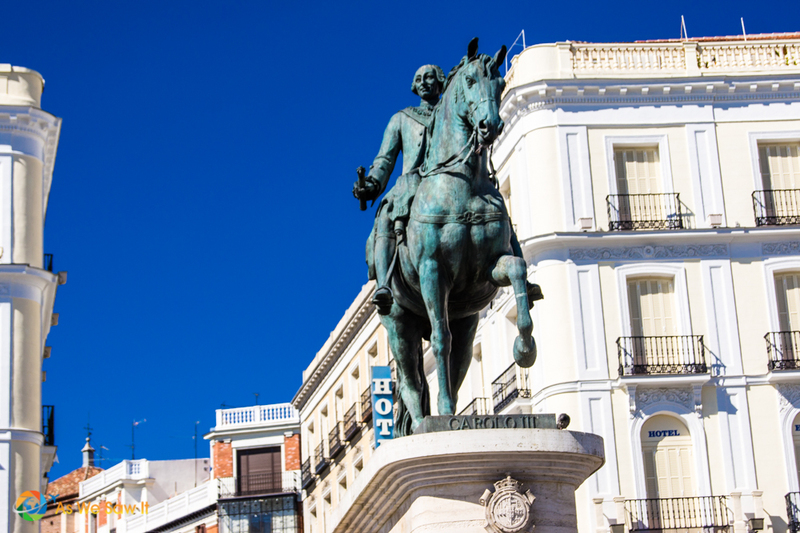 Puerta del Sol means “gate of the sun”and was the original site of the city gates. Another interesting fact is that it isn’t really a square, but a semi-circle. 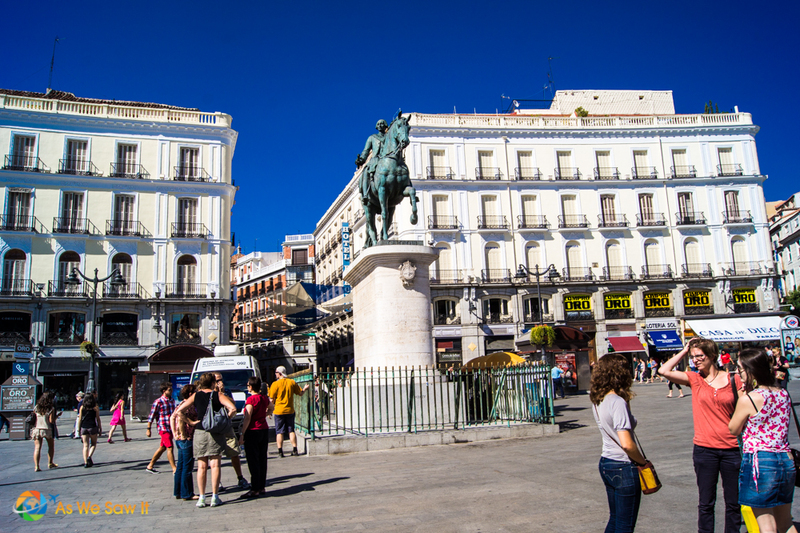 A short walk from Puerta del Sol, Plaza Mayor is probably the fanciest of Madrid's squares. It seemed the biggest to us as well because of the grand archways surrounding it. No wonder it is so popular with both the locals and tourists. It is a symmetrical rectangular square with uniform architecture, all built during the Habsburg period. 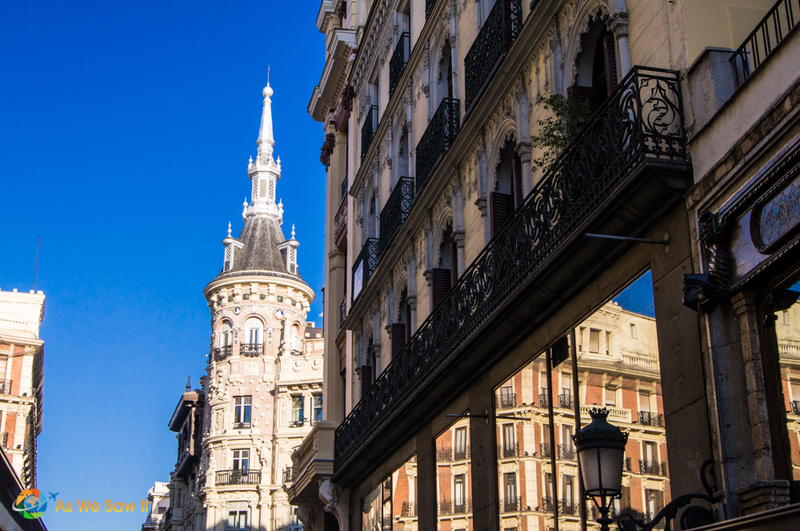 Interesting fact: Plaza Mayor is surrounded by residential buildings with 237 balconies (imagine living there!) and there are nine entrances into the square. 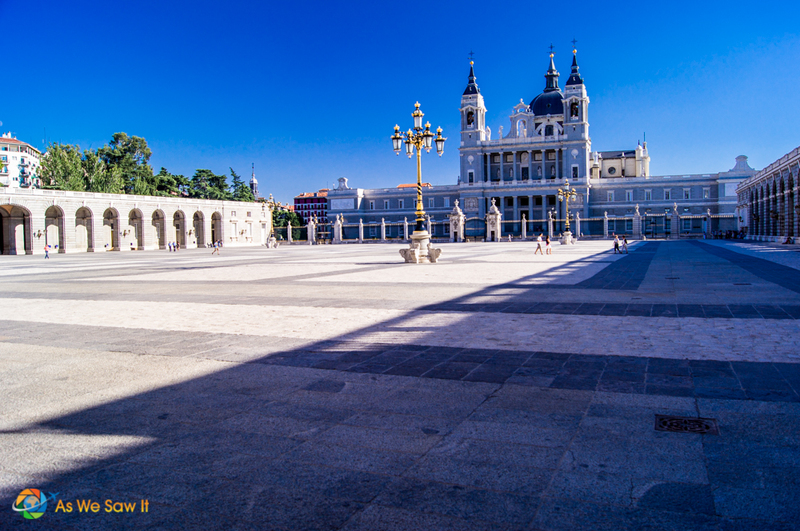 Madrid's Plaza de Oriente square was created in the first half of the nineteenth century and is located adjacent to the Royal Palace. 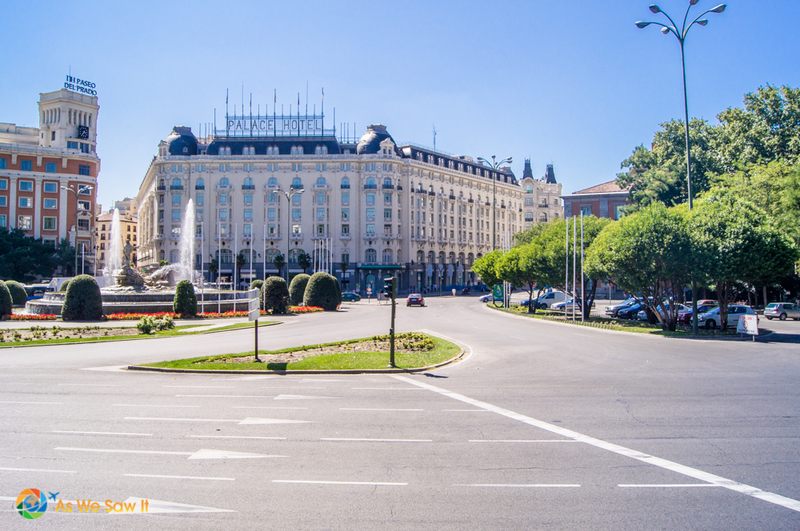 The current layout stems from a redevelopment project in the twentieth century, when they decided to turn the square into a pedestrian zone. Now it is popular with tourists who want to take a break and relax after visiting the Royal Palace. 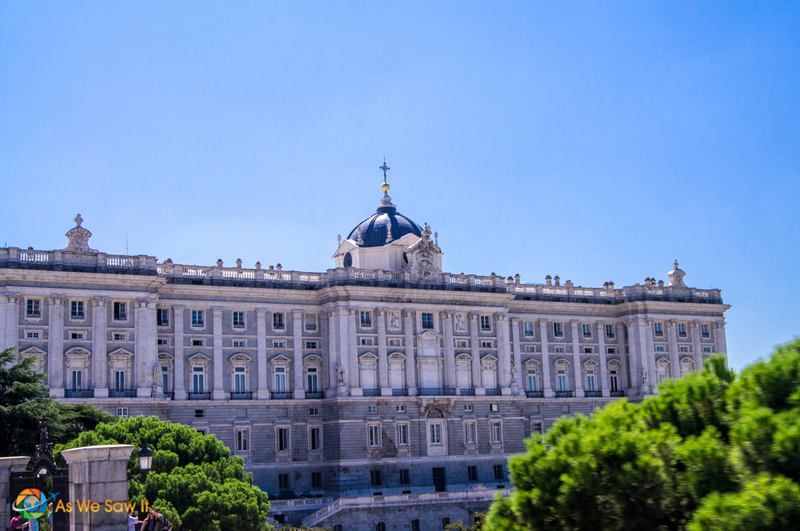 Speaking of the Royal Palace of Madrid, it is the official residence of the Spanish Royal Family. Now owned by the Spanish State, the palace dates from 1738, but today the royal family prefers to live on the outskirts of the capital in the more modest Palacio de la Zarzuela. They still use the palace for official ceremonies though, and the rest of the time it's open to visitors like us. 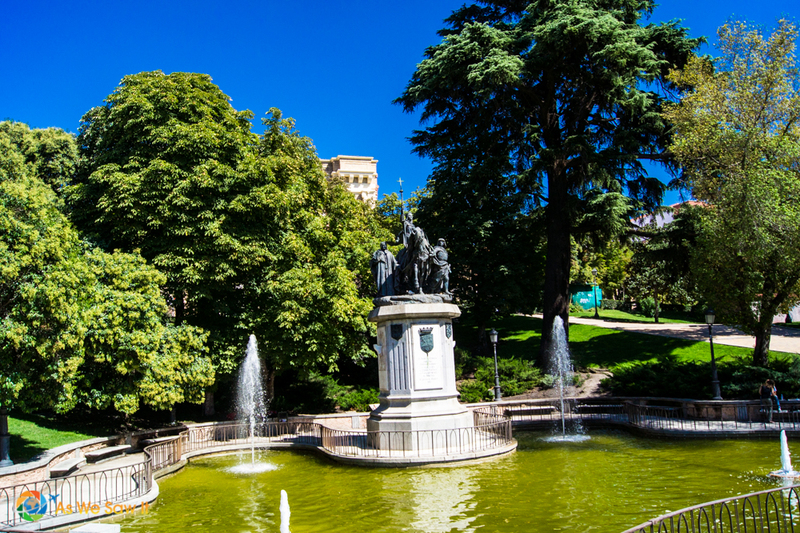 Here are a sample of the spectacular fountains we found gracing the city of Madrid. 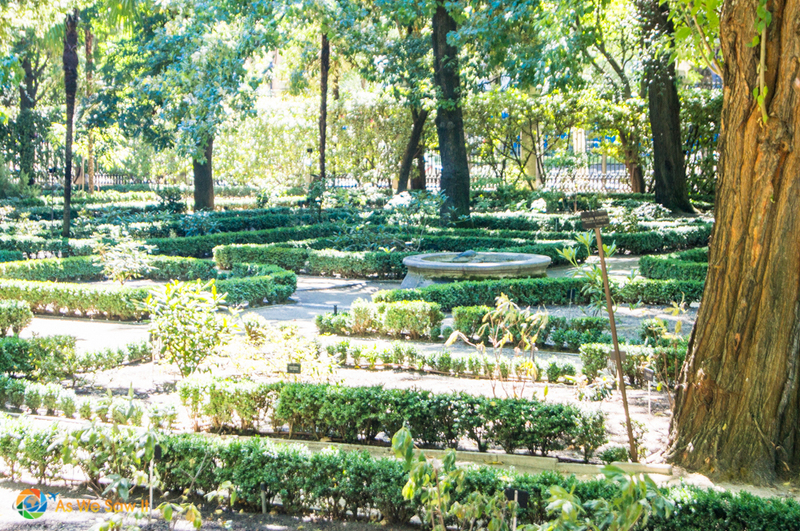 Sadly, we only scratched the surface of the city so I could only show you a few of Madrid's many squares and fountains. It is time to return home to Panama now, so we will write to you guys from there soon. P.S. – You can click the top left of any photos in our story to add them to your Pinterest boards. Yes we have, Sam. We visited Costa Brava a few years back and were quite impressed. The best-known city is Girona but its coastline is a fabulous travel destination. We have had good experiences renting local short term apartments but stayed in a hotel because we were guests of the tourist bureau. 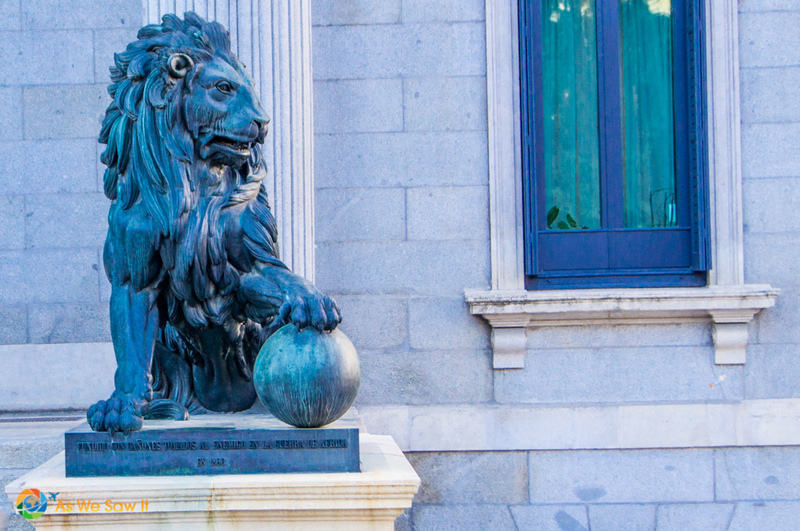 Having a good time revisiting Madrid through your photographs. Spanish plazas are ideal places to meet up with friends for the day or evening ~ where many fun experiences in Spain begin. Anyway, that’s definitely my story! Hope you were able to explore one of the plazas at length once the bus tour was over. Oh yes, for sure, Melodie. We only use the HOHO bus to get a quick orientation to a city’s layout and history, then we spend the rest of our time exploring it, usually on foot. Madrid looks wonderful! I love the huge plazas and great architecture. I would love to wander around and enjoy the fountains also! I hope to see these one day! Thanks for sharing! I’m glad you enjoyed the story, Nancie. I’m guessing you haven’t been to Spain, at least not yet? Love your post! Reading it, I realized how much we missed when we visited Madrid. Wanna go back! You know, Marcia, I think that’s the biggest problem with visiting a city. There’s always more to see than you can fit into your holiday. Haha – Rob, you’re so funny. But you’re right, Europe has fabulous public squares. Did you have any particular favorites? I love using hop-on hop-off buses. They are so convenient and brings us to great sights! Gorgeous photos! Agree about the buses. We had a great ride in your home town, too. With only a day to see Singapore we were thrilled at how well planned their route was. The best thing about Plaza Mayor are the tiny little specialist tapas restaurants all around the outside of the square. Some of the best calamari I’ve ever had is from one of those tiny little shops. I agree with you, Jim. We stayed nearby and had some great tapas at Plaza Mayor. Madrid sure is chock full of tapas restaurants and it can be hard to choose. I love Madrid! That means I had a blast looking at your beautiful photos of the city. My favorite plaza in the city has to be Plaza Espana. In terms of fountains, I like the Cibeles one. We really liked the Cibeles one too, Ruth. It’s just too bad we don’t have any images good enough to do it justice. I never realised Madrid was so pretty. 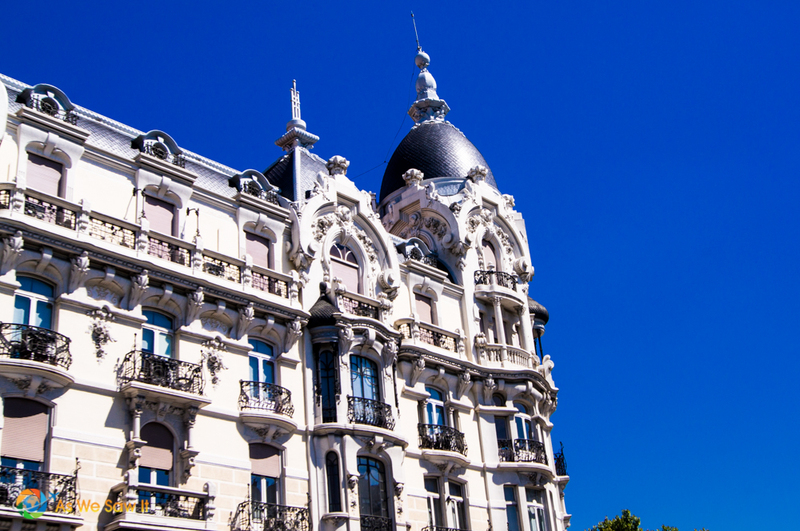 Love those balconies surrounding the square – imagine living there and waking up to that outlook every morning. There are so many pretty places in Madrid I don’t know if we could ever settle on one to live in. What gorgeous photos – look at that blue sky. Madrid is somewhere I’d love to visit. It’s funny, we didn’t really think about how good the weather was until we got home and saw the photos. Go figure. Judging by the beautiful blue skies in all of your photos, it looks like you had stunning weather. We did, Lyn. The weather was fabulous. 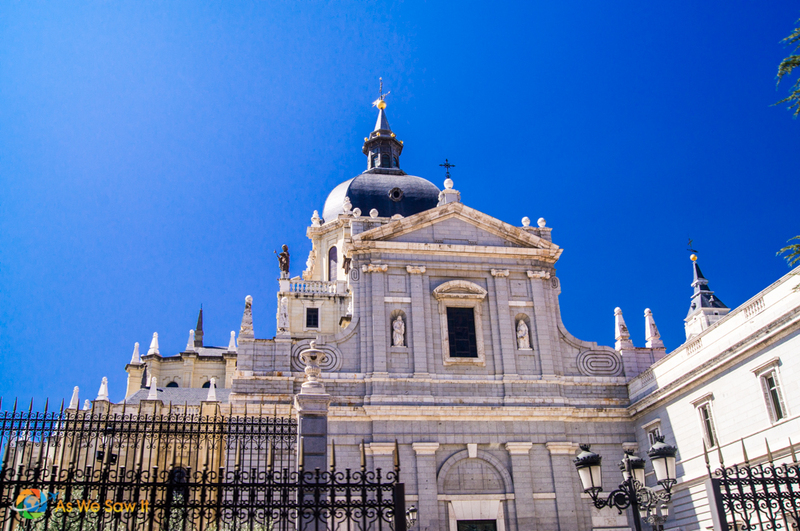 Gorgeous pictures of Madrid, Linda! Puerta del Sol wasn’t so crowded when we were there. It was in late fall and outside the tourist season, but we were very lucky with the weather. 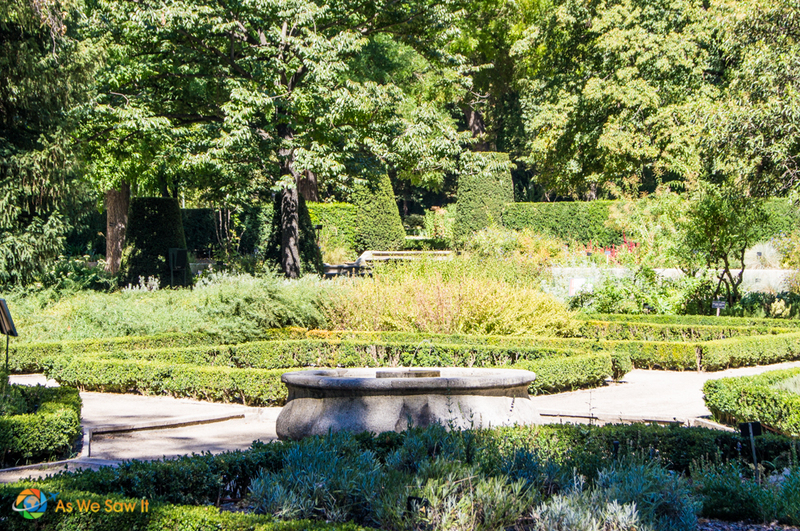 I particularly loved Parque del Buen Retiro with its Crystal Palace and Monument to Alfonso XII (to say nothing about Prado museum). There’s a lot to be said in favor of traveling off season, Anda. We weren’t able to see the Crystal Palace in the time we had allotted. I’m glad to hear it’s worth a visit. Such a sweet way to frame the city. Madrid, I promise to visit one day. I hope you have a chance to see it, Elaine.